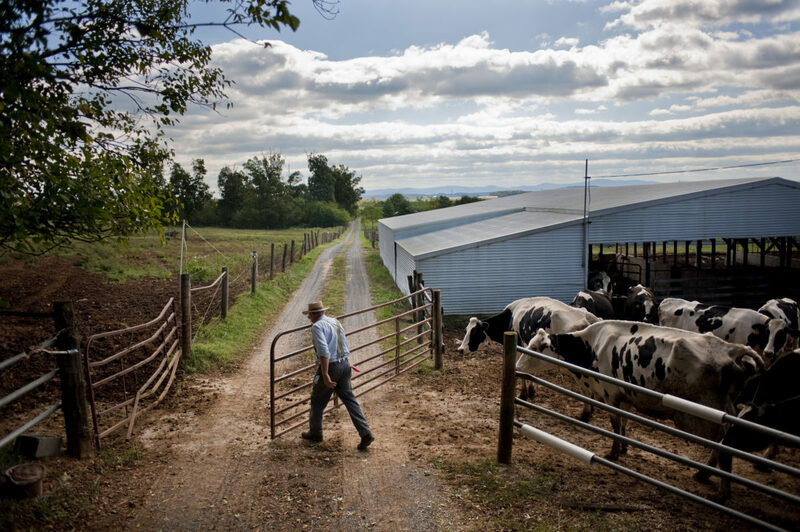 James Rhodes opens the gate to let the cattle out to the pasture. 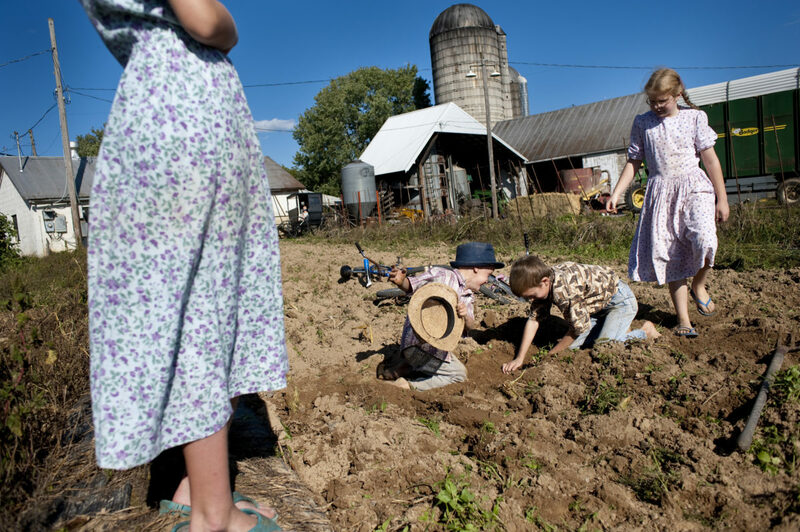 Farming is a primary occupation for Old Order Mennonites because it allows the family to work together as a unit without too many worldly distractions. 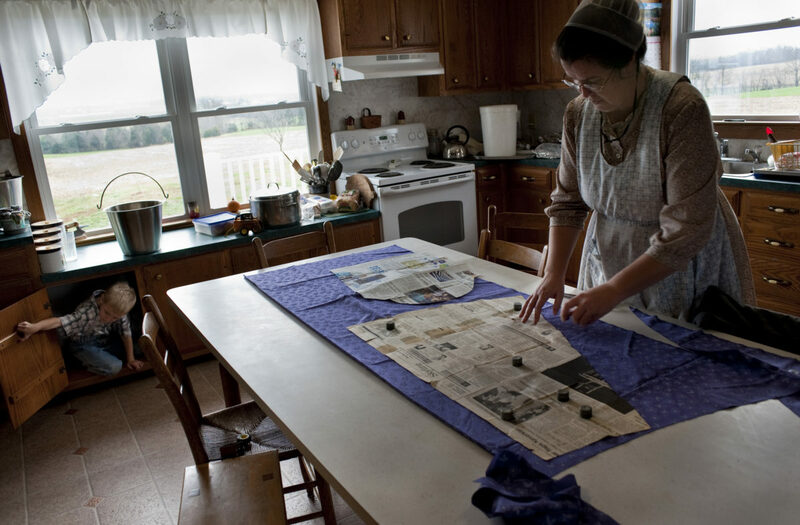 Mennonites believe in living off the land and being self-sustaining. Old Order Mennonites are a branch of the Mennonite church. It is a term that is often used to refer to those groups of Mennonites who practice a lifestyle without some elements of modern technology. Bicycles are another popular form of transportation, especially among the youth. Even though the girls wear dresses year-round, they will sometimes ride their bicycles to youth activities in freezing temperatures. Old Order Mennonites are a branch of the Mennonite church. It is a term that is often used to refer to those groups of Mennonites who practice a lifestyle without some elements of modern technology. James Rhodes spends a moment with his 4-year-old son Jesse during breakfast. 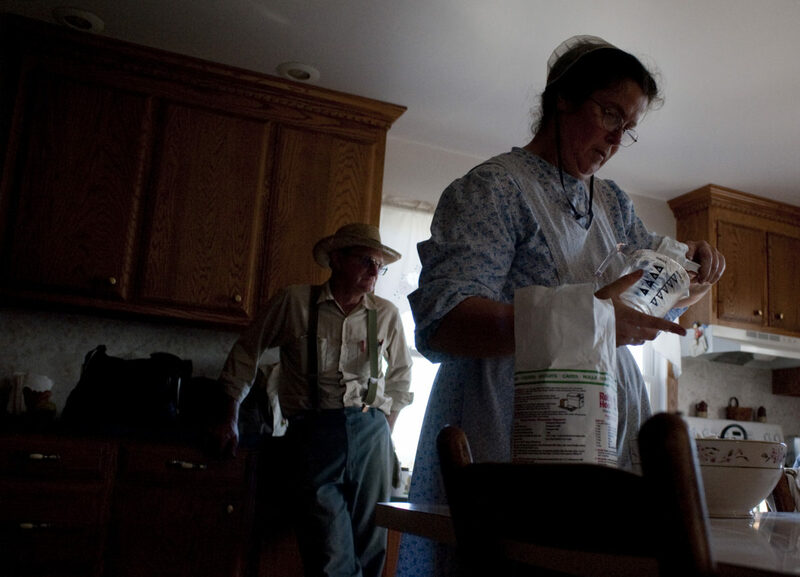 Meals together are among the most important events in the day of an Old Order Mennonite Family. The food is always blessed with a prayer and after eating, many families return thanks to God. Even though school children are gone through the day, those who are home eat together for breakfast, dinner and supper. Dinner is the noon meal and supper is the evening meal. Old Order Mennonites are a branch of the Mennonite church. It is a term that is often used to refer to those groups of Mennonites who practice a lifestyle without some elements of modern technology. Jesse Rhodes plays in the kitchen. 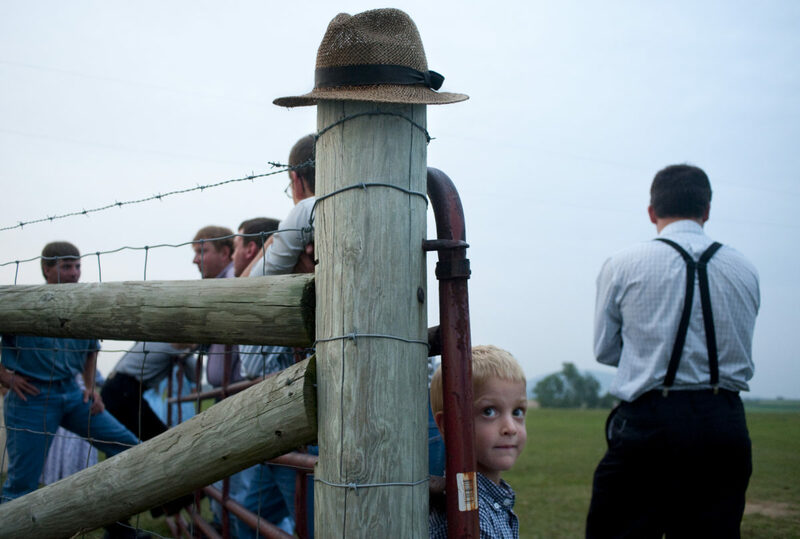 Most little Old Order Mennonite boys tend to be like any ordinary boy. Old Order Mennonites are a branch of the Mennonite church. It is a term that is often used to refer to those groups of Mennonites who practice a lifestyle without some elements of modern technology. Mary Ethel Rhodes prepares grapes for use in grape juice and grape pie. 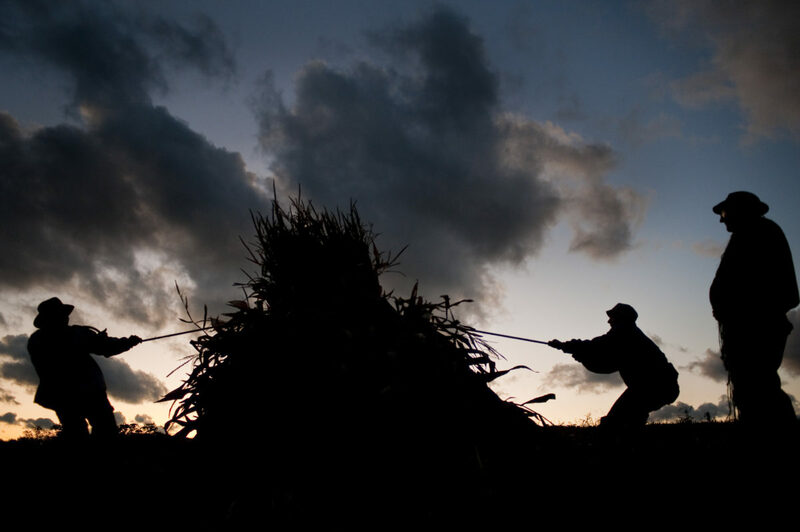 Most Old Order Mennonites rely on the harvest from their large gardens to feed them throughout the winter. Old Order Mennonites are a branch of the Mennonite church. It is a term that is often used to refer to those groups of Mennonites who practice a lifestyle without some elements of modern technology. 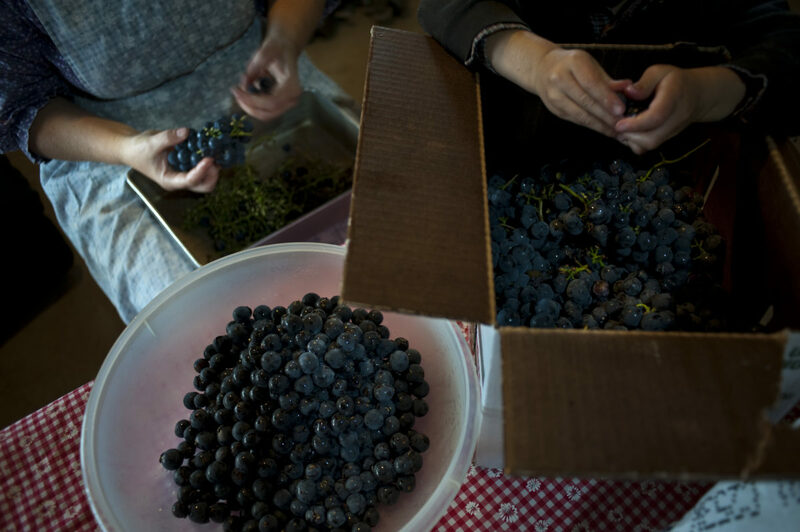 Grape juice is among the food and drink canned for winter's use. 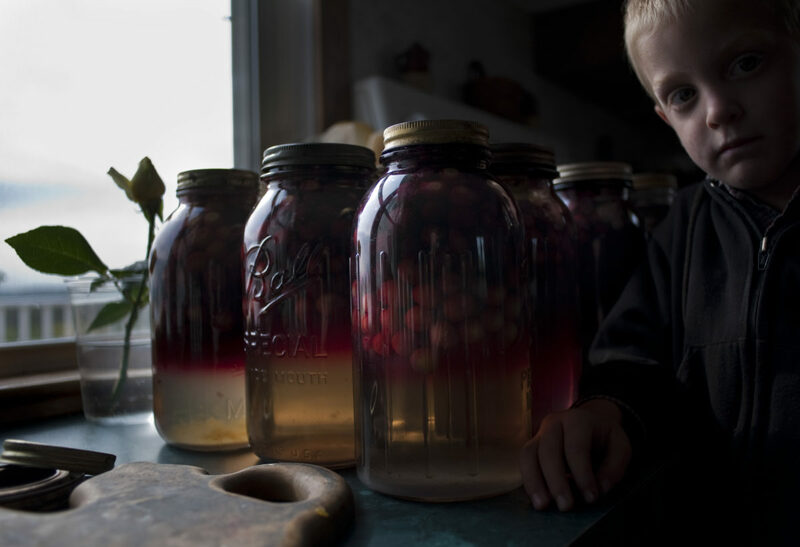 Most Old Order Mennonites rely on the harvest from their large gardens to feed them throughout the winter. Old Order Mennonites are a branch of the Mennonite church. It is a term that is often used to refer to those groups of Mennonites who practice a lifestyle without some elements of modern technology. 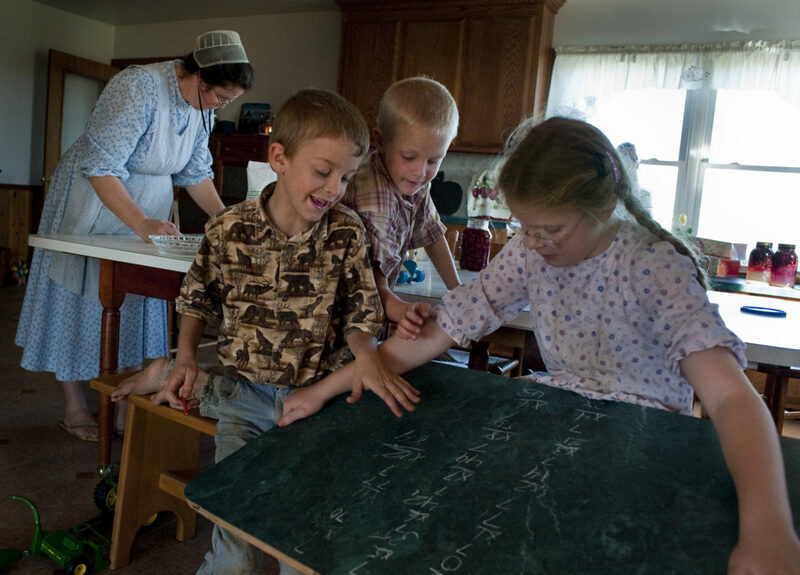 Old Order Mennonites do not have televisions or radios in their homes so the children often play board games or practice homework for entertainment. Old Order Mennonites are a branch of the Mennonite church. It is a term that is often used to refer to those groups of Mennonites who practice a lifestyle without some elements of modern technology. 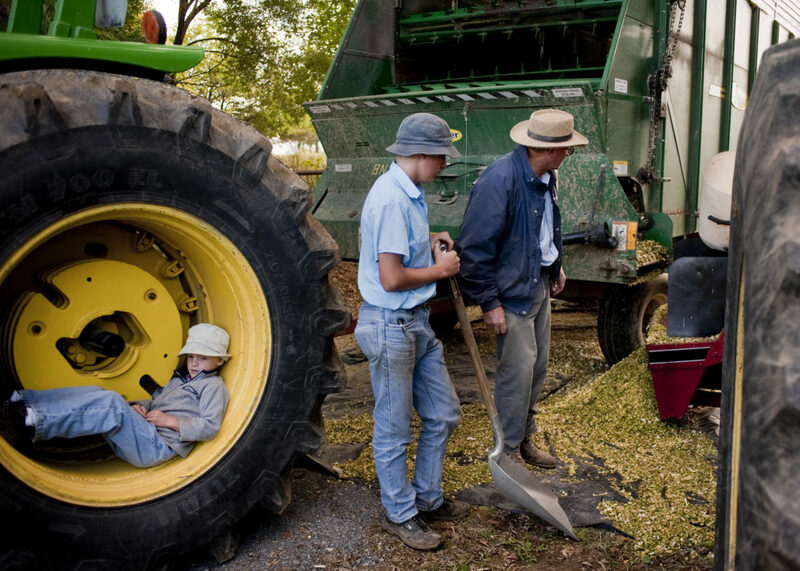 Boys who are not old enough to attend school spend their days on the farm with their father. Old Order Mennonites are a branch of the Mennonite church. It is a term that is often used to refer to those groups of Mennonites who practice a lifestyle without some elements of modern technology. James Rhodes checks the sky for signs of rain as he and his sons, Carlton and Duane plan the afternoon's chores before dinner. All aspects of the farm are a shared responsibility between parents and children. Most children as young as 7 have daily chores. When they graduate school at 13 or 14, the children often assume full-time responsibilities in the house and on the farm. Old Order Mennonites are a branch of the Mennonite church. It is a term that is often used to refer to those groups of Mennonites who practice a lifestyle without some elements of modern technology. Duane Rhodes and his younger brother Carlton groom the horses before Sunday church service. Old Order Mennonites are a branch of the Mennonite church. It is a term that is often used to refer to those groups of Mennonites who practice a lifestyle without some elements of modern technology. 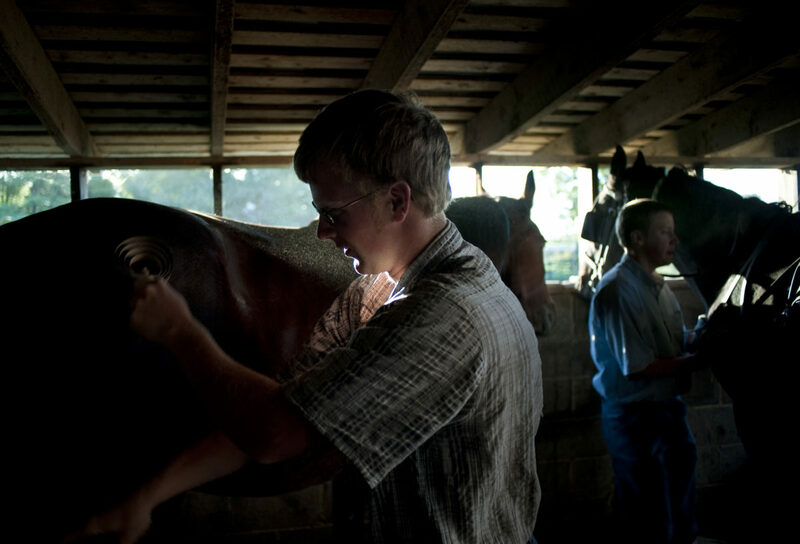 Jesse Rhodes helps his father James Rhodes shoe one of the family horses. 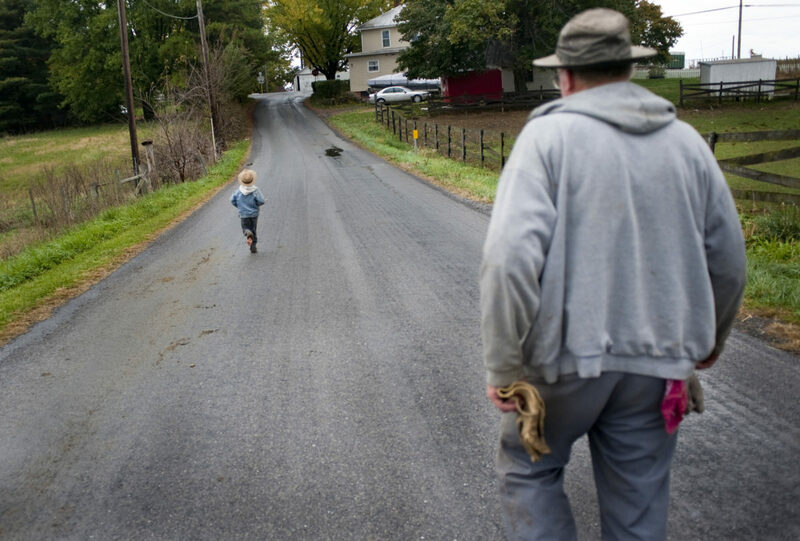 Boys who are not old enough to attend school spend their days on the farm with their father. Old Order Mennonites are a branch of the Mennonite church. It is a term that is often used to refer to those groups of Mennonites who practice a lifestyle without some elements of modern technology. James Rhodes hangs out in the kitchen as Mary Ethel makes pies for the family and to sell at the local farmer's auction. Old Order Mennonites are a branch of the Mennonite church. It is a term that is often used to refer to those groups of Mennonites who practice a lifestyle without some elements of modern technology. Jessie Rhodes hangs out with the men at a youth outing. The youth are allowed two recreation nights a week. During the summer they play softball in a cow pasture followed by a game volleyball. 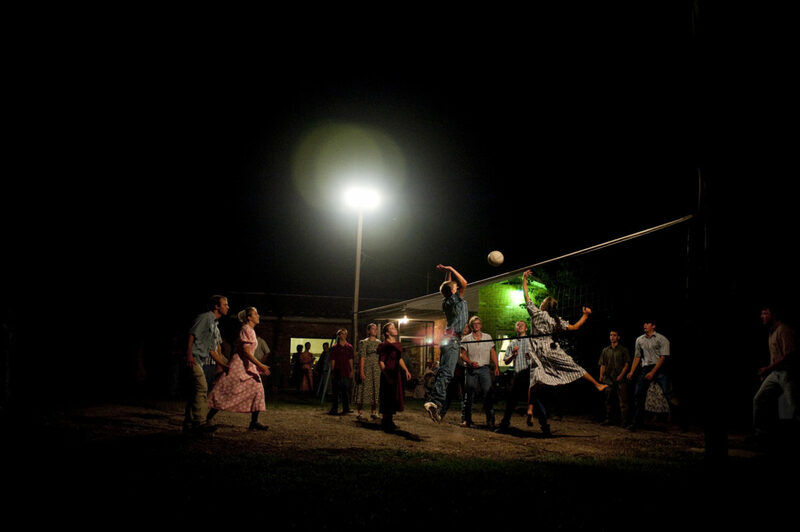 In the winter they play basketball in barns or equipment sheds. The other night of recreation is a Sunday night hymn sing in a church member's home. Old Order Mennonites are a branch of the Mennonite church. It is a term that is often used to refer to those groups of Mennonites who practice a lifestyle without some elements of modern technology. 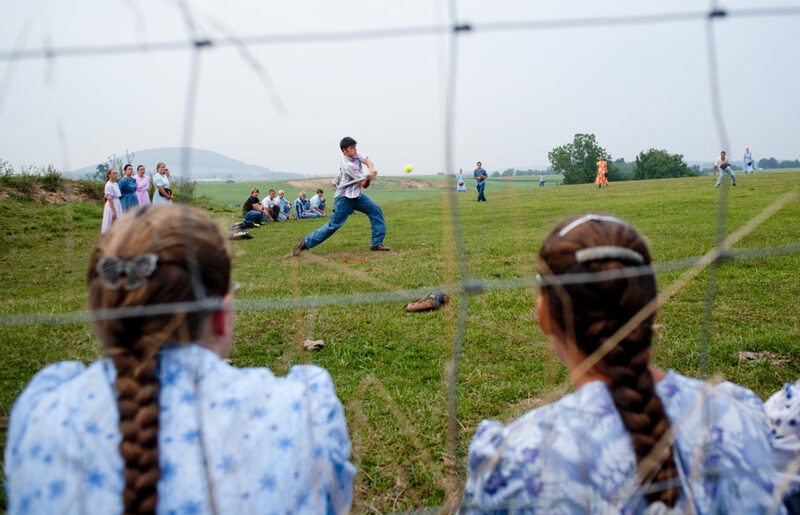 Mennonite youth play a game volleyball following their softball game. Old Order Mennonites are a branch of the Mennonite church. It is a term that is often used to refer to those groups of Mennonites who practice a lifestyle without some elements of modern technology. 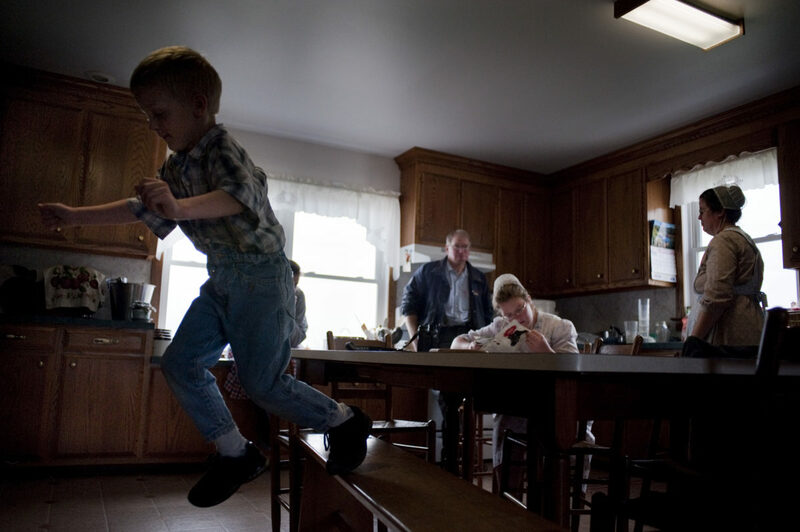 Jesse Rhodes plays around in the kitchen as his mother, Mary Ethel makes a dress for one of her daughters. Women and girls sew their own dresses. Most patterns are adapted to their plain lifestyle and are cut from old newspapers. Jessie Rhodes rides his scooter around the basement as his sister Janet and mother, Mary Ethel do their daily chores. 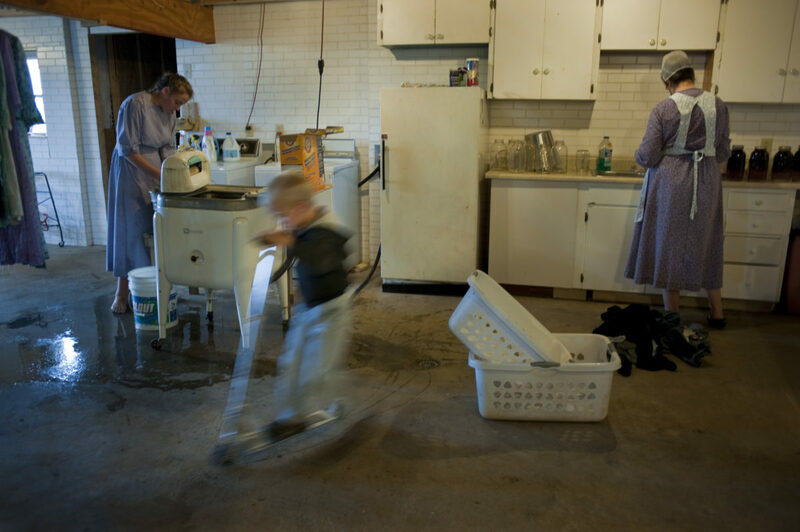 Jesse Rhodes plays around the wash as his sister, Janet does her laundry chores. Clothes are often washed in an old-fashioned wringer washer and hung on a clothesline to dry. Old Order Mennonites are a branch of the Mennonite church. It is a term that is often used to refer to those groups of Mennonites who practice a lifestyle without some elements of modern technology. James Rhodes watches as his daughters, Rachel and Marlena head to the house to help their mother. James and his wife, Mary Ethel were born and raised within a mile from where they now raise a family of 8 children. The ninth and oldest child, Brenda is married and starting a family of her own. Old Order Mennonites are a branch of the Mennonite church. It is a term that is often used to refer to those groups of Mennonites who practice a lifestyle without some elements of modern technology. Boys will be boys as Jesse and Glen play in the dirt as their sisters look on. Old Order Mennonites are a branch of the Mennonite church. It is a term that is often used to refer to those groups of Mennonites who practice a lifestyle without some elements of modern technology. 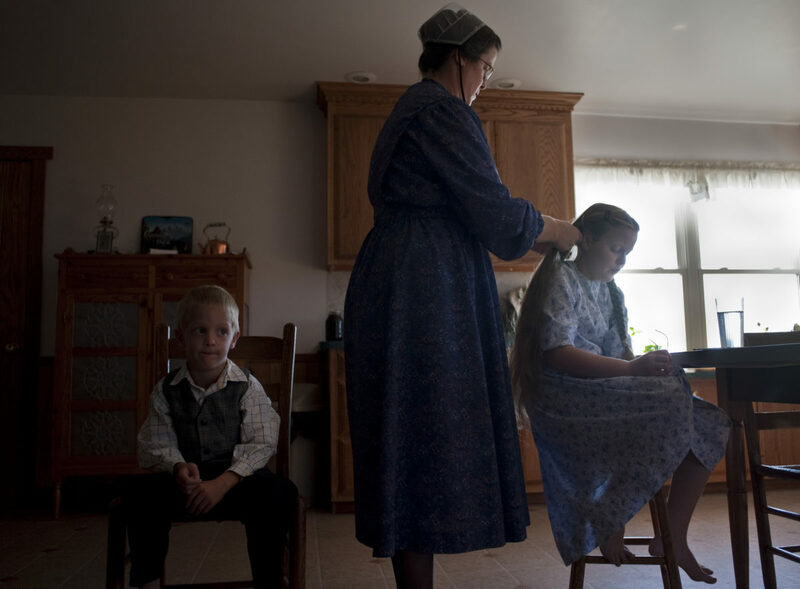 Marlena Rhodes sits as her mother, Mary Ethel braids her hair for church. Young girls wear their uncut hair in two long braids until they are 12 or 13 years old when they are allowed a single braid. They will wear the single braid until they become members of the church around the age of 17 or 18 when they will then wear it in a bun with a white bonnet over it. Girls usually join the church at 18 and the boys usually wait until 19 or 20.. Basically they join when they are ready to take communion and uphold the doctrines of the church. Old Order Mennonites are a branch of the Mennonite church. It is a term that is often used to refer to those groups of Mennonites who practice a lifestyle without some elements of modern technology. Mary Ethel Rhodes reads a story to Glenn and his younger brother Jesse before leaving for Sunday services. Sunday mornings are somber as families prepare for their church service. After the children are dressed in their Sunday best, they read or do quiet activities until they leave for church. Old Order Mennonites are a branch of the Mennonite church. It is a term that is often used to refer to those groups of Mennonites who practice a lifestyle without some elements of modern technology. James Rhodes backs the buggy out for the trip to one of the local churches for Sunday service. Old Order Mennonites travel by horse and buggy because they believe that the more conveniences one has, the faster-paced their life becomes. By eliminating modern conveniences and worldly distractions they are able to focus more on family and service to God. Old Order Mennonites are a branch of the Mennonite church. It is a term that is often used to refer to those groups of Mennonites who practice a lifestyle without some elements of modern technology. Old Order Mennonite churches do not have electricity or indoor plumbing. The men and women are segregated in the congregation and they sit on wooden slatted benches. Coat hooks line the wall for the men's hat and women's Sunday bonnets. Old Order Mennonites are a branch of the Mennonite church. It is a term that is often used to refer to those groups of Mennonites who practice a lifestyle without some elements of modern technology. 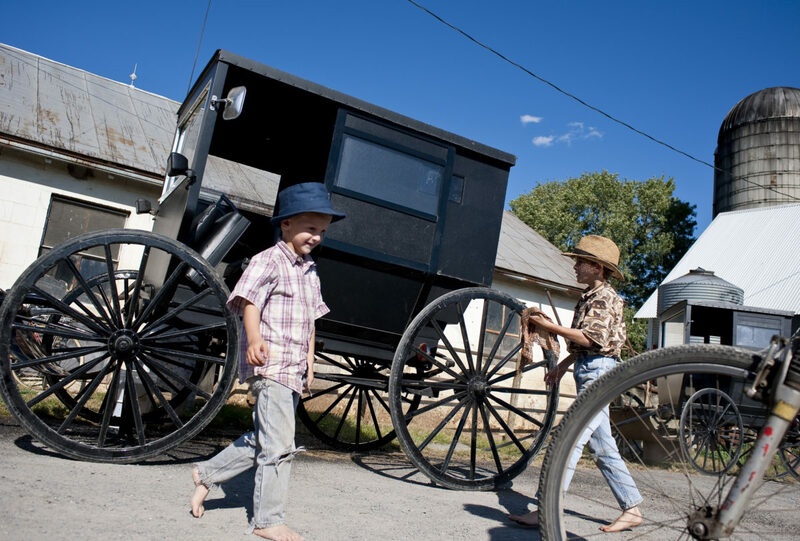 Old Order Mennonite is a term for the Mennonite groups who dress plainly and reject modern technologies. They put the disciplined church community, rather than individual religious experience, at the center of their Christian faith. 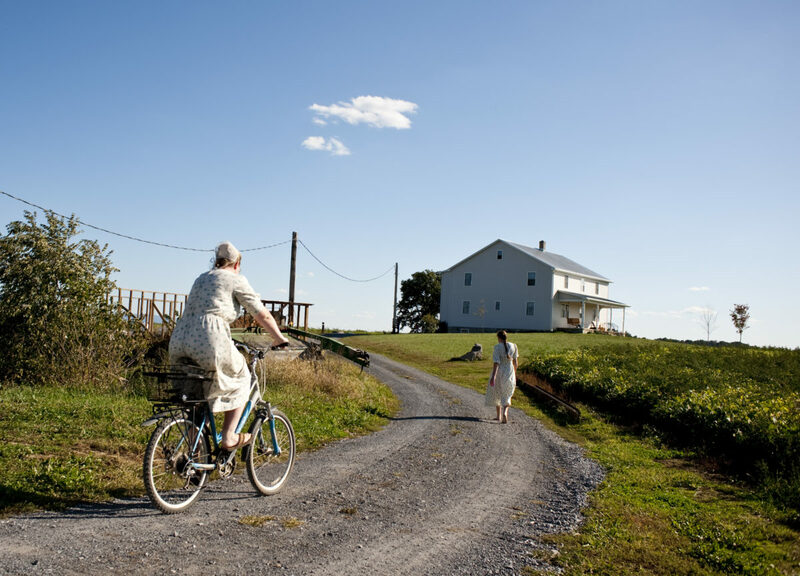 ..Old Order Mennonites are found in five major settlements in Pennsylvania, Virginia, Ohio, Indiana, and Ontario. They trace their origin to 1872, when bishop Jacob Wisler of Elkart, Indiana was expelled from the Old Mennonite Church because of his opposition to innovations, like Sunday schools, and organized separate regional groups in Indiana and Ohio. 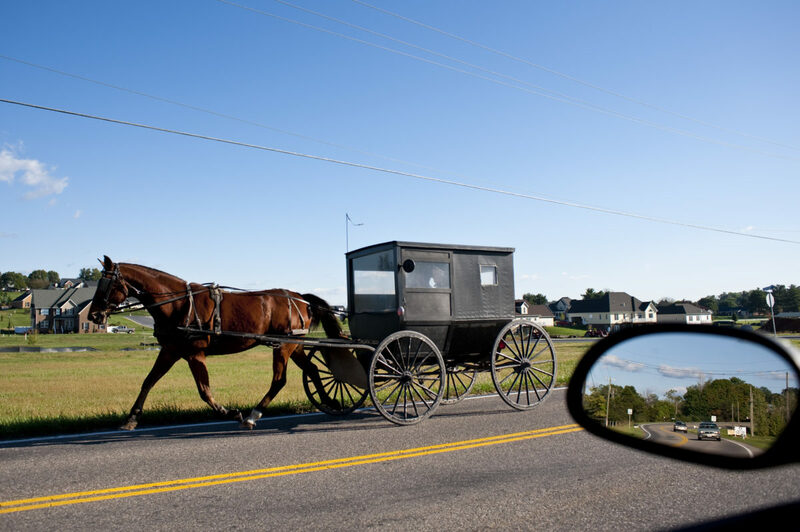 This split was followed by the organization of affiliated regional groups in Ontario in 1889, in Pennsylvania in 1893, and in Virginia in 1901 where the Rhodes family lives and raises 9 children...Most Old Order Mennonites use a horse-drawn buggy for transportation. 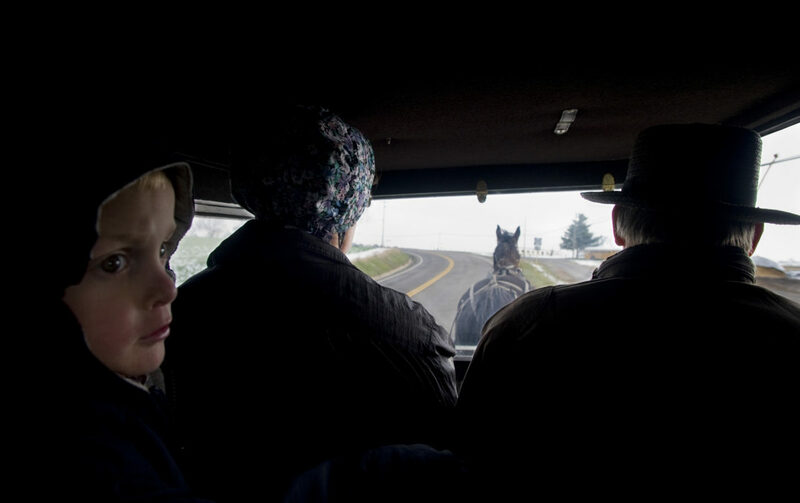 There are no heaters in most Mennonite buggies so they wear winter coats and use blankets for warmth. Old Order Mennonites are a branch of the Mennonite church. It is a term that is often used to refer to those groups of Mennonites who practice a lifestyle without some elements of modern technology. Most Old Order Mennonites harvest crops with modern equipment, but some still set corn into shocks to be used for fodder. Even though most equipment is modern, some Mennonites still use steel-wheeled tractors but they are all required to remove comfort cabs from their tractors. Even if they buy the latest and greatest tractor, they are required to reduce it to the most basic equipment needed to do the job. Old Order Mennonites are a branch of the Mennonite church. It is a term that is often used to refer to those groups of Mennonites who practice a lifestyle without some elements of modern technology. 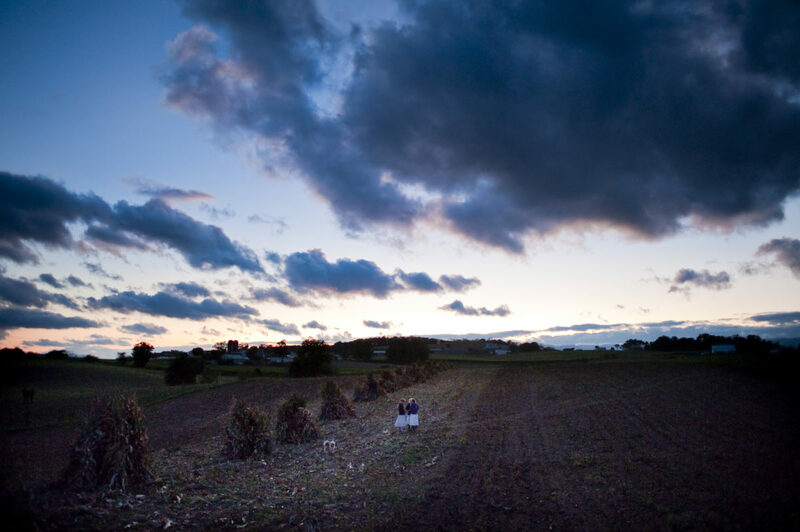 Three Old Order Mennonite girls talk in a field at sunset. Old Order Mennonites are a branch of the Mennonite church. 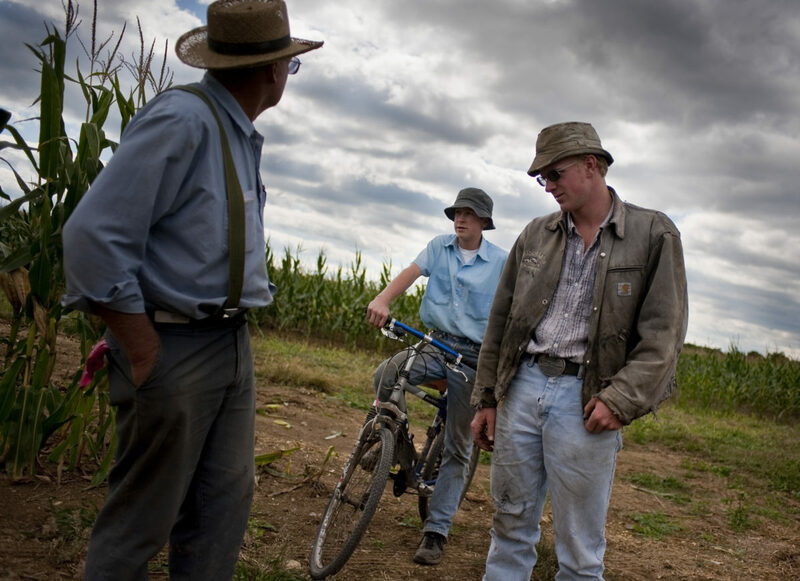 It is a term that is often used to refer to those groups of Mennonites who practice a lifestyle without some elements of modern technology. 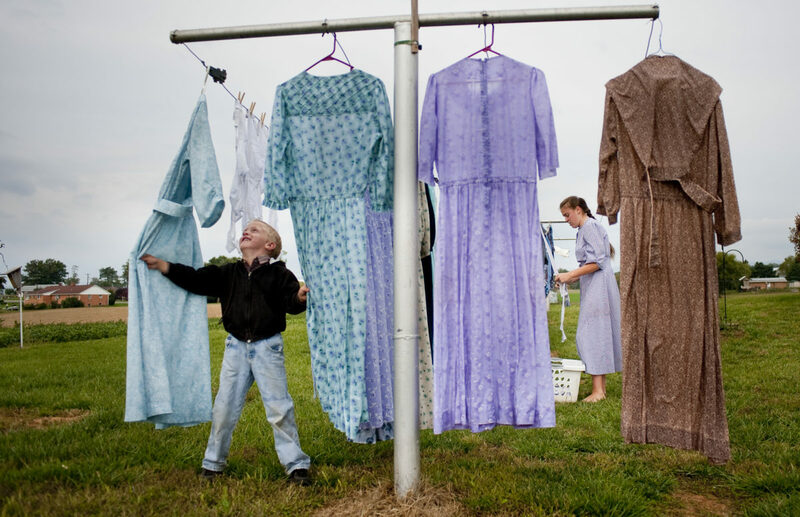 Old Order Mennonites dress plainly and reject modern technologies, living like their 19th-century forefathers. They put the disciplined church community, rather than individual religious experience, at the center of their Christian faith. 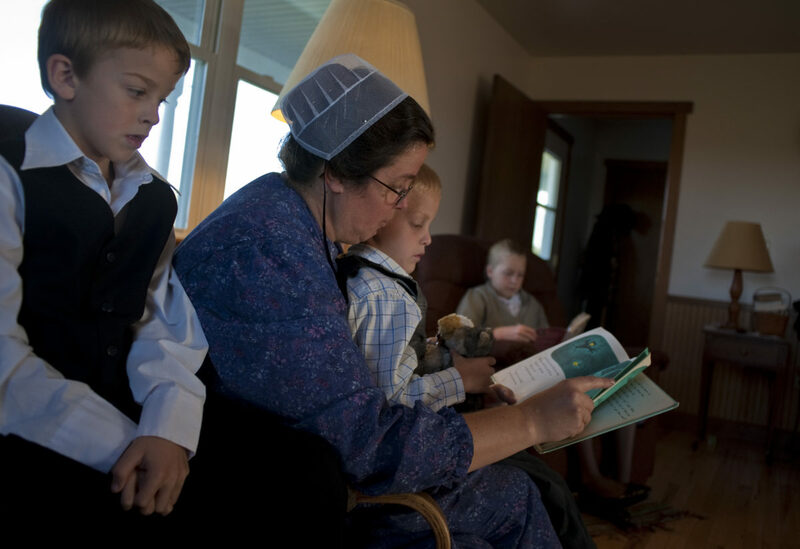 Only an estimated 17,000 adult Old Order Mennonites exist today and the numbers are dwindling. Still, families continue to pass on their traditions to younger generations. James Rhodes and his wife, Mary Ethel, are just a couple of the dozens of Old Order Mennonites who call Dayton, Va., home. The Rhodes were born and raised in the small rural community, and now they are raising their nine children as Old Order Mennonites as well.